I understand you are a pet enthusiast, and you intend to have pet cats and rabbits get along together in your house. 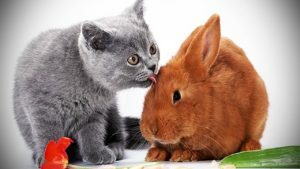 Cats and rabbits can go along together however first you have to recognize the similarities and differences between these two animals which I have explained in this article. I have explained whether your pet cats will attack rabbits, as well as can cat be friends with rabbits. 1 Cats and Rabbits: The similarities as pets. 2 Cats and Rabbits: The differences as pets. 3 Do cats and rabbits get along together? 3.1 The best way to introduce cats and rabbits. 4 Do cats attack rabbits? Discover better! 5 Do cats eat rabbits? 6 Can cats be friends with rabbits? 7 What makes bunnies better pets than cats? Cats and Rabbits: The similarities as pets. Although rabbits being a prey animal and cats considered predators, they have some similarities in general as house pets. Both rabbits and cats are comfortable within the running space of your house, unlike dogs which require some exercise like walking outside. Cats and rabbits can be litter trained and they will not make your house dirty once they are trained. Cats and rabbits they require frequent grooming but they don’t need a shower like dogs or other pets. In fact, both cats and rabbits will self groom themselves. In fact, showering your rabbits can be very dangerous if you don’t learn how to do it properly. To bathe your rabbits properly click here. House cats and rabbits like to sleep a lot and they both are crepuscular animals. Crepuscular means that they are most active during dawn and dusk. Other than dawn and dusk these two animals like to sleep and rest all the time. Most predator animals prefer to stay active during the day time and sleep during the night. It is remarkably strange that although cats are a predator, they like to sleep during the day. Both cats and rabbits can keep them entertained using toys. Having toys for cats and rabbits is extremely essential due to the fact these two animals get bored very easily. So in case you spend a lot of time outside of the house or busy at work you must have some toys for your cats and rabbits to keep them self occupied. Cats and Rabbits: The differences as pets. The major difference between cats and rabbits is that rabbits are prey animals and cats are predators. Perhaps you are thinking it is not a wise idea to keep predators and prey as pets to go along together in the house. Yet that is not the case. You can keep these animals together in your house but you have to learn first how to do so. Actually, I have explained everything in this article, so continue reading. Rabbits are herbivores animals and mostly love chewing on hays all day long. On the other hand, cats are carnivores. Rabbit poops are dry and not smelly and can be cleaned easily if they litter around in your house by mistake. But rabbit urine can be very smelly, that’s the reason why you have to potty train your rabbits. Cat poops are very smelly therefore they must be litter trained and they require a different kind of litter to prevent odor in your house. Cats are more active animals than rabbits. Yes, rabbits like to run around and jump around, will get excited to see you back in the house. Your house rabbits will only jump on sofas and climb on beds. But cats can jump higher, climb higher and they will not hesitate to scratch on a material of your house to keep themselves satisfied and busy. As a result, cats can get a lot noisier than rabbits which you may not like as a pet owner. Cats are passionate animals and wish some petting but I think they can go along all day by themselves. However, for rabbits, they cannot live without companions. If you have a single rabbit in your house, that rabbit will search for companionship and stay close to you at all time. When a rabbit stays close to you, it seems very cute, but I suggest every house rabbit owner to always buy a couple of rabbits so that they can give company to each other. Discussing companionship, it is important that your house rabbits are neutered or spayed. If you don’t do so your rabbits will breed very fast and in no time your house will look like a rabbit farm. Unlike cats as they can stay alone in the house, there is no need for de-sexing them. But male cats must be desexed because if they are not desexed, they will try to be territorial by spraying urine here and there in your house. Now as I have stated earlier that rabbits must be neutered and spayed to restrict them from further breeding, it is equally important for rabbits to be desexed to give them a healthier life. A rabbit may live up to 12 years if spayed or neutered. The average lifespan of a rabbit in the wild is only three years because they are not desexed. Hence if you want your house rabbits to live a longer life with you, it is a must to visit a vet for rabbits and get them desexed. Unlike cats, they have a prolonged lifespan. Cats may live up to 20 years around you. Visiting vets for rabbits can be costly because rabbits are considered as exotic animals and rabbits must not be treated as equal as a cat. You must not take rabbits to the regular vets. So finding a vet only specialized for treating rabbits can be difficult and expensive. Finding a vet for a cat is not difficult at all. Due to the availability of regular vets, treating cats will not be as expensive as nursing your rabbit’s health issues. Do cats and rabbits get along together? YES, cats and rabbits can get along together, however, only if they are introduced to each other at a young age and proper measures must be taken before introducing them. In the wild, cats are predators and rabbits are prey animals, but house cats and rabbits are a bit different therefore it is not impossible for them to live together in your house. The best way to introduce cats and rabbits. Animals are unpredictable so are cats and rabbits. So while you are trying to get cats and rabbits to get along together, you must do it with caution. Start with meeting for a short duration, and gradually increase the time they spend together once you figure out that they are comfortable with their companionship. You can begin by putting your rabbits in a cage at first. The cage must have bars that are too small for the cats to reach for your rabbits. Let the rabbit stay in the cage for a while. It may take several weeks to months for the rabbit to realize that the cat is not his/her enemy in this house. During that whole time, you have to keep your rabbit inside the cage and prevent your cat from harming the rabbit. Once you notice that the rabbit is getting comfortable and is starting to feel safe around your pet cat you can finally bring the rabbit outside its cage. However, you cannot begin by allowing the rabbits and let them freely run around in the house with the cat. You have to start by slowly introducing the cat with the rabbits. Let the rabbit continue in his/her own pace and discover that the cat is safe. But initially, you must provide them only a short time for them to interact with each other. You have to keep an eye on whether the rabbit is comfortable around the cat and does it feel safe around the cat. If that is not the case then stop the interaction immediately. Nevertheless, this practice goes best when both the cat and rabbits they are young and similar in size. If the cat is smaller in size than the rabbit, it is highly likely the rabbit will become bossy and territorial. On the contrary, if the cat is bigger than the rabbit, the cat might show its predatory characteristic towards the small rabbit. Here is a link to an article where you can read more on >>> How to present a cat and rabbit depending on which one comes in the house first. Do cats attack rabbits? Discover better! In the wild cats and rabbits are enemies, so YES, cats attack rabbits. But domesticated cats and rabbits can grow friends if they engage each other when they are babies. As well as if you want to keep pet cats and house rabbits at the same time, the first option is to understand your pet animals behavior before you let them get along together. Is your cat submissive and calm? Is your rabbit assertive and not aggressive? It is best when the cat is submissive and the rabbit is assertive. If that is not the case, and the cat is aggressive and the rabbit equaling the prey animal, it is very likely the cats will attack the rabbit. But always be very accurate with the cat and rabbit friendship. Because a friendly cat swat, even a playful bite can cause severe issues for your house rabbits. Cats are predators in the wild and may eat rabbits but only if the cat is bigger than the rabbit. Cats avoid attacking prey animals those are bigger than the size of themselves. Nevertheless, it is unusual for house cats to eat rabbits, and you as a pet lover it is your responsibility to take precautions before allowing these two adorable animals to live together. Can cats be friends with rabbits? 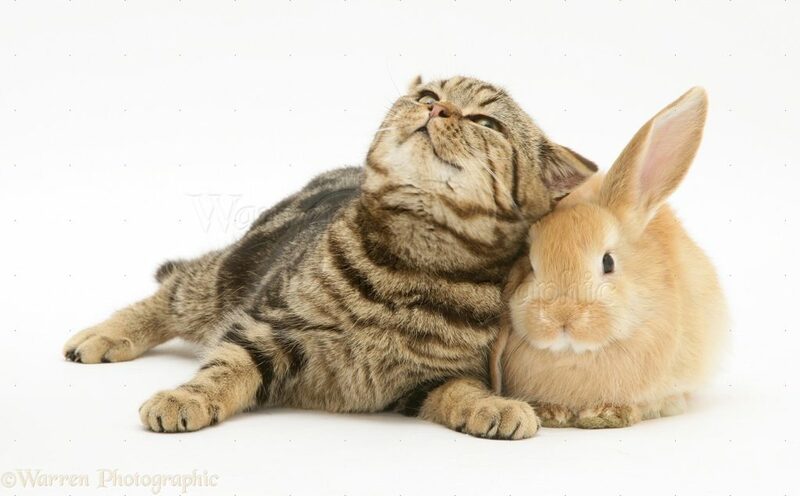 Cats and rabbits can be friends and in the long run, can grow a very good companion for each other. But the troublesome part is introducing pet rabbits with cats which require proper supervision and caution. If you have house rabbits and are willing to bring home a cat, then there is nothing wrong with that. In that case, you must refer to the paragraph where I have mentioned earlier how to properly introduce cats with rabbits. I can assume that you intend to bring a new furry friend for your house rabbits. That’s actually an excellent idea for your pets. Rabbits are a very social animal and need companionship. It is sometimes difficult to introduce a new rabbit to the old one. Hence it gets more complicated when you are trying to befriend a cat with your house rabbits. Remember this success of an interspecies friendship is dependant on the will of individual animals as well as the pet owners’ right directions involved. 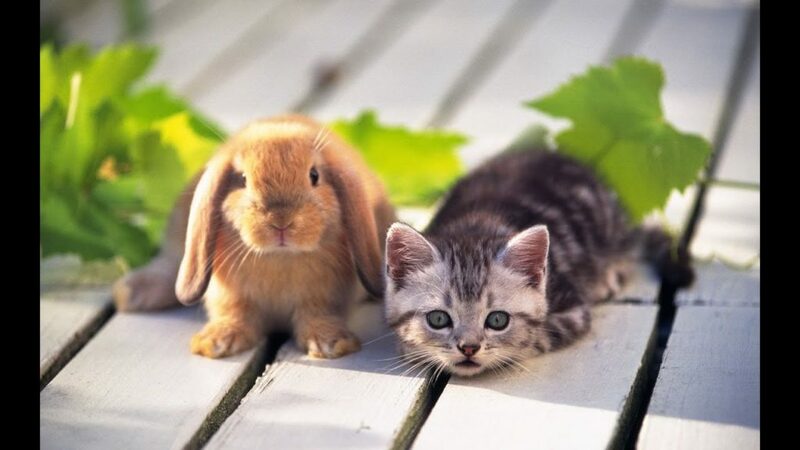 Nevertheless, cats can be friends with rabbits! All you have to do is be careful and prevent them both from attacking each other. What makes bunnies better pets than cats? Bunnies are intelligent animals, which requires less space than cats and definitely a bunny will make your house less messy compared to a cat. If you are hesitant about which animal to bring home as a pet, it really depends upon you which one you prefer more. Eventually, a pet owner always falls in love with their pet. I personally prefer bunnies over cats, but both of these animals have their own pros and cons. I think rabbits can be the sweetest pet ever in the world. Read more about the pros and cons of pet rabbits here. If you want to compare the pros and cons of cats and rabbits as pets click here.